Bats are difficult to identify at the best of times - even using the latest technology. This is a list of the bats that have (to the best of our knowledge) not been recorded in Warwickshire but breed in the UK. However, this doesn't meant that we don't have them! This bat just loves old woodland, and in the past used to be plentiful in Britain. However, since we cleared all the trees they have lost their homes and so now are very rare. They have their strongholds in a few southern counties including Dorset where their comings-and-goings were documented by the BBC Radio 4 programme Batman and Rosie. These bats get their name from the strange flap of skin around their nose that is sort of horseshoe-shaped. They are called 'Greater' as they are larger than their smaller cousins the Lesser Horseshoe bats (very logical really - Spock would be proud). They are very fond of caves, especially in the winter time. They are mainly found in the South West and Southern Wales. Of course, not only may we have any of these local visitors, but there could be a number of overseas tourists visiting our county. The following bats are vagrants i.e. species that have been occasionally recorded in the UK but are not thought to actually breed here. Like our own Pipistrelles this species has taken advantage of human structures especially for its summer roosts. It is thought to use cliff crevices and cellars in the winter. It is similar to other Pipistrelles but is larger and tends to be lighter and yellowish coloured. Its fur colouring can be very variable with medium or yellow brown shades on its dorsal side and light grey fur on its underside. Its ears, nose and membranes are a blackish brown colour. To date (2005) there is about 10 records; the first report occurring in 1991. One of these cases was when a holidaymaker returning home from Cyprus opened their suitcase and out popped a Kuhl's Pipistrelle stowaway. Another appeared near a Felixstowe dock. Its normal range is throughout Southern Europe from Spain through France to East Caucasus and is regarded mainly as a Mediterranean species but recently has undergone an expansion of its range northwards. It is found up to 51°N in the Ukraine and there is a maternity colony on Jersey. It has a forearm length of 31 - 36 mm, a head and body length of 40 - 47 mm and a wingspan between 210 - 240 mm. Its weighs between 5 - 10 g.
This bat is widely distributed from eastern France to central Europe and much of Scandinavia including above the Arctic Circle. Mainly a species of woodland edge, it also occurs in farmland and villages. It roosts in buildings and occasionally hiding among boulders on the ground in caves. Like other vagrants, this species is most likely to occur in autumn or winter. It is similar in appearance to the Serotine (Eptesicus serotinus) with a post-calcarial lobe, long shaggy dark chestnut fur with gold tips and 2- 3mm of tail free from the membrane. However with a forearm length of 37 - 44 mm it is a smaller bat and much more richly coloured. There are sporadic records of this bat in the UK. One comes from Surrey where one was found wintering in the same site two years running. A couple of records come from North Sea oil rigs. 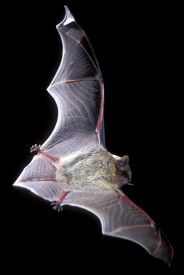 This bat is found in caves and mines in winter and mainly in trees and buildings in summer. It is a medium-sized bat with a head and body length of 41 - 53 mm, a wingspan of 220 - 245 mm and a weight of 7 - 15 g. It is distinguished by a deep notch in the hind margin of each ear. Its long dense and shaggy fur has a reddish woolly appearance on the underside; especially near the tail. Its ears resemble those of a Natterer's but are parallel when viewed from the front (Natterer's are splayed). 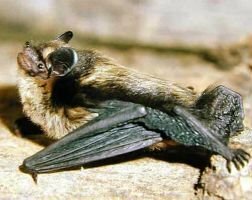 There are 2 records of this bat in the 1800s, one found around the port of Yarmouth and another from the port of Plymouth. Between 1927 and 1984 three turned up in Shetland and there continue to be reports from the islands. It has been confirmed on the UK mainland at least six more times. It is a well-known migrant with recorded movements of up to 850 km and has turned up occasionally on North Sea oil rigs and ships. It occurs in woodland and farmland but also frequently in towns. Summer roosts are in trees, buildings and rock fissures. In winter it can be found in deeper caves and cellars or even high in buildings. 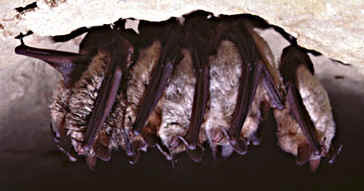 It is a medium-sized bat with forearm length of 39 - 49 mm and long claws. It has squarish ears and a short curved tragus with a blunt round end. Its fur has dark brown base and light tips and its head and ears are a dark brown colour. Its underside fur is strikingly white or grey compared to that on its back and its skin is dark brown. The ears and membranes are thin and translucent. The tip of the tail extends 4 - 5 mm beyond the membrane. As its name suggests this bat is likely to be found near water. It is a northern European species that undertakes short migrations. In winter it roosts mainly in caves, while summer roosts are frequently in the roofs of buildings or church towers. It is similar in appearance to Daubenton's but is larger with a thick-set head. It is a medium-sized species with a forearm length of 43 - 49 mm, a head and body length of 57 - 67 mm, wingspan of 200 - 320 mm and a weight of 14 - 20 g. The fur is greyish-brown often with pale tips with the whitish underfur extending on to the undersurface of the tail membrane near the leg as far as the notably large feet. 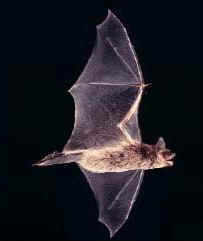 The echolocation calls of the Pond Bat are similar to all the other Myotis species i.e. frequency modulated sweeps from about 100 kHz to about 20 kHz. However, the peak frequency (loudest part) of the call is at about 35 kHz compared to 45-50 khz for all other UK Myotis species. It can also be recognised by a curved middle part to the sweep, sometimes extending to a long, almost constant frequency part. In flight it's like a large Daubenton's bat, but faster and not quite as agile. 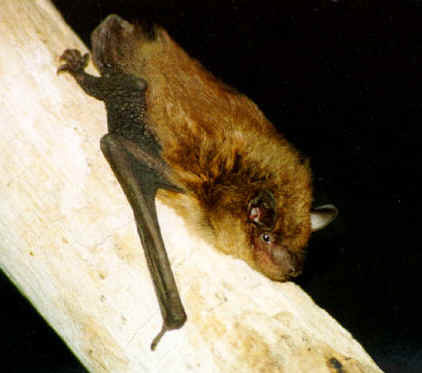 In March (2005) it was confirmed that a Pond Bat (Myotis dascyneme) had been found in Kent. The bat was in a wall in Ramsgate and was rescued by Les Hoare of the Kent Bat Group in September last year. Unfortunately the bat died shortly after, although Les found no obvious injuries, and like all dead bats it was sent to the Veterinary Laboratories Agency (VLA) in Weybridge. This bat is similar to Daubenton's but has an ear length of 14 - 18 mm (Daubenton's: 8 - 12 mm) and its fur is not dull but sleek and glossy. The fur colouring varies from yellowish and brown to nearly black, with the under parts being noticeably lighter. Flight membranes and ears are very dark brown. The feet are covered with long fine hairs extending beyond the claws. It is a small to medium sized bat with a wingspan of only 220 - 270 mm weighing between 5 - 11 g.
Another bat from North America that usually finds passage on a ship to this country. Big Brown Bats will often choose to live year round in or on areas of buildings for shelter, maternity colonies and hibernation. They will also use more natural habitats such as hollow trees and caves. They do not appear to be very social as they are often found alone or in small groups. They also tend to hibernate alone until low temperatures force them to congregate. It appears similar to the Serotine but it is usually smaller with a forearm length of 42 - 51 mm. The posterior edge of the curved tragus has a distinct abrupt bend in the lower third of its structure whereas the Serotine has a smoothly curved tragus. It is a medium sized bat with a wingspan of 320 to 390 mm and their weight is between 11 - 25 g. The colour of their fur varies from between yellowish and brown to nearly black. Flight membranes and ears are very dark brown. Hoary bats are the most widespread of any American bat and are the only bat known to occur in the Hawaiian Islands. Considered a solitary bat, they roost primarily among foliage in trees, but have been found to roost under planks, in caves, in cavities made by other animals, and under leaves on the ground. The thick fur on Hoary bats provides great insulation and they can tolerate a great temperature range. A large bat with a forearm length of 46 - 58 mm. Its dorsal hairs are tipped white giving a frosted appearance and the tail membrane is completely furred on the dorsal side. It is among the largest of North American bat species, measuring 130-140 mm in length and possessing a wing-spread of almost 384 - 415 mm. The bat's fur is a dark mahogany brown with silver frosting over the back. In 1847 a Hoary bat turned up on South Ronaldsay which is one of the Orkney Islands. Although it is known to be a long-range migrant and has turned up in Iceland, where it is not a resident species, it is doubtful that it could have made the trip across the Atlantic without the help of a ship of some sort. Between 1980 and 1999 there have been 2 records of this species. Both had been assisted on their travels by humans. One was found in the cockpit of a US plane and another amongst some imported wood. The silver-haired bat is a medium sized bat. It has a wingspan of 270 - 310 mm and a forearm length of 37 - 44 mm. It receives its name from its dark, silver-tipped fur. The bat's fur is usually black in colour, however some individuals may be dark brown with yellow-tipped fur with relatively short round and naked ears. 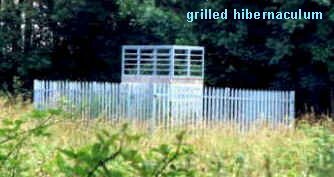 In 2003 a male of the species decided to come and visit the UK, or more precisely a Cornish churchyard where he was discovered by a dogwalker. Luckily for him he was taken in by Cornwall Bat Hospital as he was very weak and underweight. Free-tails are very distinctive large bats with a tail that hangs freely behind them. Having very long narrow wings they are very able fliers, and have been recorded reaching speeds of 60kph with a tail-wind (excuse the pun).The ears are long and broad, protrubing forward over the eyes its wrinkled "bulldog" face. 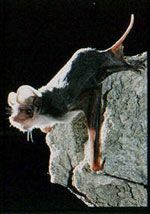 The European Free-tailed bat inhabits warm Mediterranean regions. They roost in cracks in cliffs or in buildings, even in large cities. Another North American bat to arrive in this country with 'assisted' passage is the Mexican Free-tailed bat. In came in with a consignment of bananas. It gets its name from the long mouse-like tail that extends beyond its tail membrane. Its body is approx. 9cm long and has a wingspan of about 30cm. Its fur is a greyish-brown colour and is paler underneath. It has a small wrinkled upper lip. These bats live in caves in the southern United States, Mexico, Central America, the West Indies, central Chile and Argentina. Their colonies are the largest congregations of mammals in the world! The largest colony is found at Bracken Cave, north of San Antonio, Texas, with nearly 20 million bats! 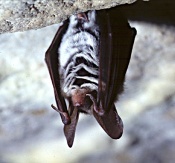 The 100 million Free-tailed bats living in Central Texas caves consume approximately 1,000 tons of insects nightly, a large proportion of which are agricultural pests. These clouds of bats are visible on weather radar and researchers watch emerging bats ascend to altitudes of 1,000-10,000 feet to feed on migrating cotton boll worm moths, army cut-worm moths, and other costly agricultural pests that migrate north from Mexico.